Jim Carrey's latest artwork is a glowing tribute to both Beto O'Rourke and "the record number of women who rose to the challenge of restoring the balance" in the 2018 midterms. The actor-comedian-artist tweeted that a "star was born" in Democrat O'Rourke, who narrowly failed in his bid to unseat incumbent Sen. Ted Cruz (R-Texas) on Tuesday but who is now being touted as a potential rival to Donald Trump in the 2020 presidential election. 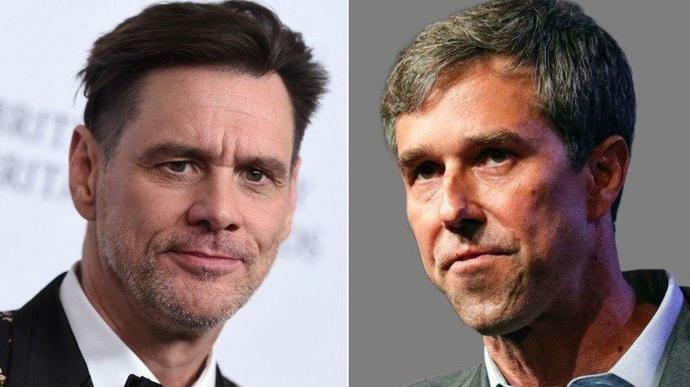 Carrey hailed O'Rourke as "a smart and decent guy who very nearly turned Texas blue" in the new cartoon shared online Wednesday. "There are great things in store for this budding Mr. Smith," he added, in an apparent reference to the 1939 James Stewart movie "Mr. Smith Goes To Washington."